Plan ahead. Like anything in life, a little pre-planning will make the transition easier. 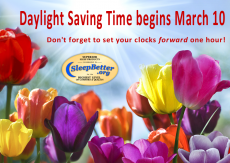 Try to go to bed a little earlier each night leading up to the time change. If you do, the lost hour won’t be as much of a shock to you. Use light to reset your body clock. Utilizing bright light in the morning and dim light at night is the best way to adjust yourself to your new schedule. Eat breakfast in front of a window where the light shines in, and avoid bright lights in the evening. Take a short nap. If you find that you’re exhausted and disoriented in the early afternoon, lay down for a short nap. Don’t sleep for more than 20-30 minutes, however, and try to keep from taking your nap too late in the afternoon. Use caffeine if you have to. An extra cup of coffee on the day of the time change or the day after is no big deal. Try to avoid it in the afternoon, however, as it may keep you from sleeping well at night. Have you ever wondered how much that “lost hour” of sleep costs? In 2013, SleepBetter crunched the numbers and figured it out. Click to learn the Cost of the Lost Hour. What Kind of New Pillow Should You Buy?